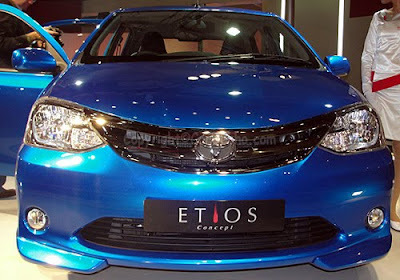 In the flood of technology a new wave has arrived........ passionate car lovers here is stunning Toyota Etios to give you wings. Sparkling Toyota Etios is fully embedded with latest technology and design to provide you world class technology and quality. The design is Based on Bold Simplicity which is refer to affordable luxury and functionality in one machine. Toyota Etios will have to compete with cars the likes of Maruti Swift, Skoda Fabia, Hyundai i20, Fiat Punto and upcoming Ford Figo. Toyota Etios has arrived with two exciting models - sedan and hatchback with different colours. Price range for Hatchback is expected to be 4 to 5 lacs and sedan is 7 to 9 lacs range. To give you excellent power, mileage and accleration Toyota Etios sedan model is powered with 1.5L petrol mill it generates over 100 bhp of peak power. The hatchback model of Toyota Etios is fit with 1.2 litre petrol mill. Top power from this engine is around 80 bhp. To give you better fuel economy,standard and power both engines are refined and tuned very well. They are embedded with VVTi technology. Toyota Etios surely give a 12 kmpl mileage in city and 16 kmpl on highway. The Exteriors and Interiors are really designed and framed in such a way that is quite enough to make you gaze. Extremely eye-catching and eye-soothing appearance. Dashboard has A.C vents at both ends, a touch screen audio system with additional steering mounting audio controls. Interiors are designed to give you real comfort and luxury. Seats are widely comfortable with proper legroom and headroom space. It has multifunctional steering. 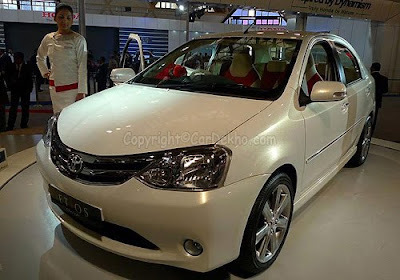 Toyota Etios hatchback is five door vehicle for five passengers (including driver) can be seated while a four door vehicle Toyota Etios sedan in which four passenger can sit. Toyota Etios has got six-spoke alloy wheels. The sedan variant will be having 2550mm of wheelbase and 2640mm . Toyota Etios has the tyre size of 175/65 R14 and 185/60 R15 ......strong tyres for strong cars. It has disc brakes with Front independent and rear non-independent shock absorbers. For handling and safety it has two airbags, parking sensors and fog lamps with probably ABS and traction control. Music is the heart of drive for that it has touch screen audio system with all satndard media equipment. So get ready for drive.